Crossover SUV’s are hot! The reason is that they provide a great blend of comfort, safety, practicality, and fuel economy in a stylish package with all-wheel drive (AWD) availability. To assist you with your selection between the many great options available, we’ve matched up the 2016 Honda HR-V vs 2016 Mazda CX-3 (Other vehicles on your list might include the Nissan Juke and Jeep Renegade) . Both models have attractive designs so it’s up to you whether you prefer the look of the Honda HRV or the Mazda CX3. When you purchase a crossover SUV, you expect a little extra power under the hood. 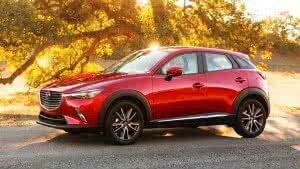 That is why the CX-3 comes equipped with the Skyactiv 2.0-liter 4-cylinder engine. The HR-V also brings to the table a respectable 1.8-liter SOHC 4-cylinder. Both models come with optional AWD and, as expected, both models could save you a lot at the fuel pump with great fuel economy. The CX-3 GX FWD (base trim) comes standard with automatic 6-speed transmission, with the option of the top-end GT trim and column mounted paddle shifters. Paired with a user activated sport mode that rev matches on downshifts, the CX-3’s automatic transmission is a real pleasure to drive. 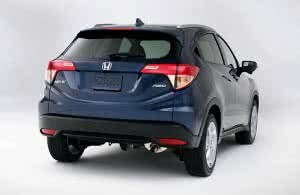 The HR-V offers either a 6-speed manual or an automatic Continuously Variable Transmission (CVT). To get automatic CVT with HR-V, buyers will have to spend more. High tech features are also a must have for many buyers, and thankfully, the 2016 Mazda CX-3 and 2016 Honda HR-V both have you co2016-honda-hrvvered with nearly identical features. For your entertainment purposes, the CX-3 provides a 7-inch touchscreen colour display. The HR-V also comes with a 7-inch touchscreen display with its higher trim levels. Also of similar quality are the connectivity options available in the two models. Both vehicles keep you safely connected to the outside world through Bluetooth wireless technology and their respective smartphone integration systems. The CX-3 comes with Mazda Connect, while the HR-V uses the Bluetooth HandsFreeLink phone interface. The 2016 Mazda CX-3 vs 2016 Honda HR-V comparisons show that both vehicles are great crossover SUV options and all it comes down to is your personal preference. Take a look at our inventory to see the models in stock. You can also call or stop by the dealership to receive even more information on the 2016 CX-3. On a final note, the Mazda CX-3 is manufactured in Japan whereas the Honda HR-V is made in Mexico. Many manufacturers (including Mazda) are producing some great products in Mexico, but we still give the nod to Japanese production.